Collins Booksellers - GRADE 8 - GET READY FOR HIGH SCHOOL MATHEMATICS by Dennis Weichman, 1230001762457. Buy this book online. Dennis Irwin Weichman (MR. W) holds a Bachelors degree and Masters degree in mathematics from the University of Western Ontario. His series of Math Study Guides capture his teaching methodology best practices from 30 years as a high school teacher and 20 years as a private math tutor. It all started with the idea of simplifying the process of teaching math using a step by step approach. 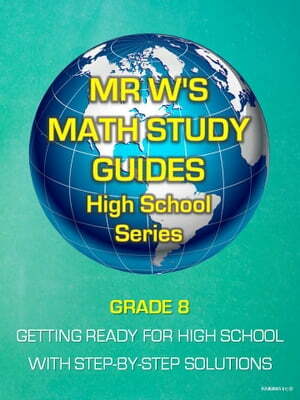 MR. W's Math Study Guides will lead you through each step to enable a better understanding on how to get you to the right answer. Most importantly once you understand the process, it's repeatable! MR. W started with some handwritten notes and a few on-line videos to reach those he could not meet with personally. To date, his YouTube viewers have watched his 55 videos more than 85,000 times from more than 150 countries around the world. This lead to MR. W printing and delivering over 20,000 books around the globe including North America, Europe, Africa and Asia using the old school, print, and mail system. It's a great success story about a teacher who is making a difference for as many students, parents, and teachers as possible.